The Institute for Local Self-Reliance is pleased to release the Community Broadband Map and report, Publicly Owned Broadband Networks: Averting the Looming Broadband Monopoly. The map plots the 54 cities, big and small, that own citywide fiber networks and another 79 own citywide cable networks. Over 3 million people have access to telecommunications networks whose objective is to maximize value to the community in which they are located rather than to distant stockholders and corporate executives. ILSR has been tracking telecommunications developments at the local and state level, working with citizens and businesses to preserve their self-determination in the digital age. 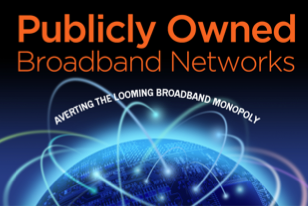 Quietly, virtually unreported on, a new player has emerged in the United States telecommunications sector: publicly owned networks. Today over 54 cities, big and small, own citywide fiber networks while another 79 own citywide cable networks. Over 3 million people have access to telecommunications networks whose objective is to maximize value to the community in which they are located rather than to distant stockholders and corporate executives. Even as we grow ever more dependent on the Internet for an expanding part of our lives, our choices for gaining access at a reasonable price, for both consumers and producers, are dwindling. Tragically, the Federal Communications Commission has all but abdicated its role in protecting open and competitive access to the Internet. Now more than ever we need to know about the potential of public ownership. To serve that need the Institute for Local Self-Reliance has published an interactive Community Broadband Map that gives the location and basic information for existing city owned cable and fiber networks. The communities featured on the Community Broadband Map have overcome many formidable obstacles to build their networks. The results are impressive: millions of dollars of community savings; some of the best broadband networks in the country offering a real choice to residents and businesses; and increased investment from incumbent cable and phone companies as they respond to a new non-profit competitor. Yet even now, when publicly owned networks have proven their importance and viability, powerful entrenched telecommunications companies continue to lobby state legislatures to thwart publicly owned networks. Meanwhile, Washington, DC, refuses to protect the right of communities to build the networks on which their futures depend. For several years ILSR has been tracking telecommunications developments at the local and state level. We have worked with businesses and communities protecting their right to self-determination via the fundamental infrastructure for the information-based economy. This report offers some of our findings.